The day after Christmas I went with friends to the top of Jukkoku Pass in Shizuoka Prefecture, which offers fabulous views of Mount Fuji in one direction and the Izu Peninsula in the other. We decided to hike down rather than take the cable car and bus, but shortly after we began our descent we came across a pair of men’s dress shoes lined up neatly by the side of the path, toes pointing toward the thick bamboo woods. For some reason, I was afraid the shoes meant that a suicide had taken place, and I insisted that we take a picture and notify someone. My hunch was confirmed by how seriously the park office took my report. They sent up a search party and called the police, but I don’t know what happened after that. Can you find out? And can you explain why Japanese take off their shoes before they commit suicide? No, and while we’re making comparisons, let me interject that Japan’s rate of suicide is the highest among all the G7 countries, and more than twice the rate of that in the United States. In 2004, 32,325 people in Japan took their own lives, more than four times the number who died in traffic accidents. Men are far more likely to commit suicide than women, but in some age groups suicide is the leading cause of death for both sexes. Suicide is a very serious problem in Japan, and one that affects those left behind too. That’s why on Dec. 26 — the very day you found those shoes — the government announced a plan to reduce the number of suicides to about 25,000 per year over the next decade, largely by increasing the availability of counseling. 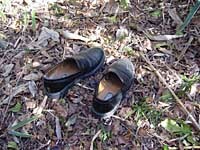 I asked several people why Japanese might feel the urge to remove their shoes before committing suicide. Some had expertise in the psychology of suicide, some did not. The theories included the following: so as not to carry dirt from this world into the next; to indicate that the death was a suicide; to increase the chances of the body being found; because that’s what samurai used to do; and because it’s what they’ve seen on TV (it’s a cliche in television dramas to indicate a suicide by showing a pair of shoes on a cliff or the roof of a building). The most neurotic rationale offered, by quite a few women who have obviously spent too many years lining up shoes in entranceways, was that it’s better to remove one’s shoes than have them come off during the fall and land in some embarrassingly untidy way.